San Francisco, CA — Contrary to what has been reported in the media, Lady Gaga’s gay and lesbian fans are “absolutely thrilled” by her decision to align with the conservative-leaning Target Corp. for exclusive distribution rights to a deluxe edition of her new album, Born This Way. In a statement to the press, the San Francisco chapter of the Gays United for Love, Liberation, Life & Equality (GULLIBLE) shot down suggestions that the gay and lesbian population of the United States of America is up in arms over Lady Gaga’s partnership with a corporation that has knowingly donated hundreds of thousands of dollars of reported money and possibly many millions more in unreported cash to American political groups with decidedly anti-gay agendas. “That’s just, like, so wrong and everything. We totally love this deal! Like, we get bonus tracks and remixes and stuff,” said chapter president Bernard Munster, 18, while posting “Like, Born This Way is so wicked awesome!” to his Twitter account for the 67th time. 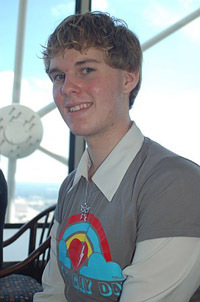 The first year Academy of Art University Fine Arts student and part-time Starbucks barista stared quizzically into the air when asked how he felt about the fact that by supporting an artist that works with people who support anti-gay ideals, he is perpetuating discrimination against homosexuals. Lady Gaga, "Born This Way"